Commissions are your agent’s slice of the pie and main source of income, so it’s a big motivator for them to sell your tours. It can be tricky when setting commission rates to find the right balance between what motivates them and what keeps you earning a profit. Here’s how you can determine the percentage of commission you should give to each of your agents. What type of agent are you working with? There are 3 types of agents in the booking process: retail travel agents, tour wholesalers, and inbound tour operators. 25%-30% of retail price for inbound tour operators. If you’re unclear on the role of each of these agents, read this post first. You don’t need to pay commission to each of these distributors separately – if you use an ITO and the commission is 30%, they will then pass 10% on to the wholesaler and 10% on to the retail agent. SmallBusiness WA have provided a great formula that you can use. It’s important to note that some operators offer additional “over-ride” commission to encourage sales, which is generally 2-3% on top of existing commission rates. Ok, so now that you’re done setting commission rates, it’s time to implement them into your booking system. In Rezdy, you do this via your Catalog, which is created in the Inventory > Catalogs menu. 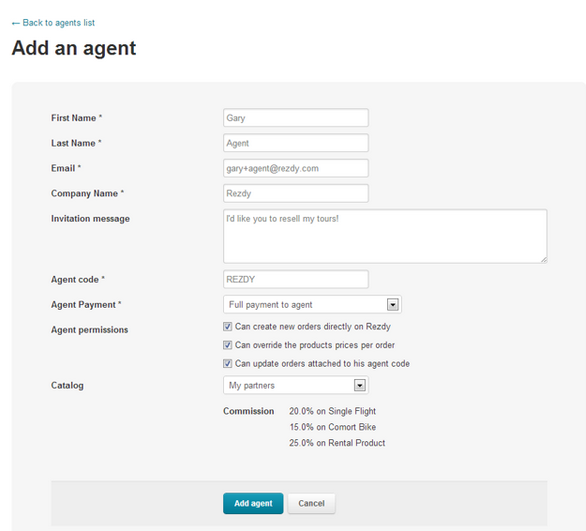 When you add an agent, Rezdy will ask you to select a Catalog. Once you have completed all the steps to add your agent, your agent will receive an email inviting them to use Rezdy to book with you and receive commission. When they accept, they will have a clear view of what products and commission rates you have assigned to them.